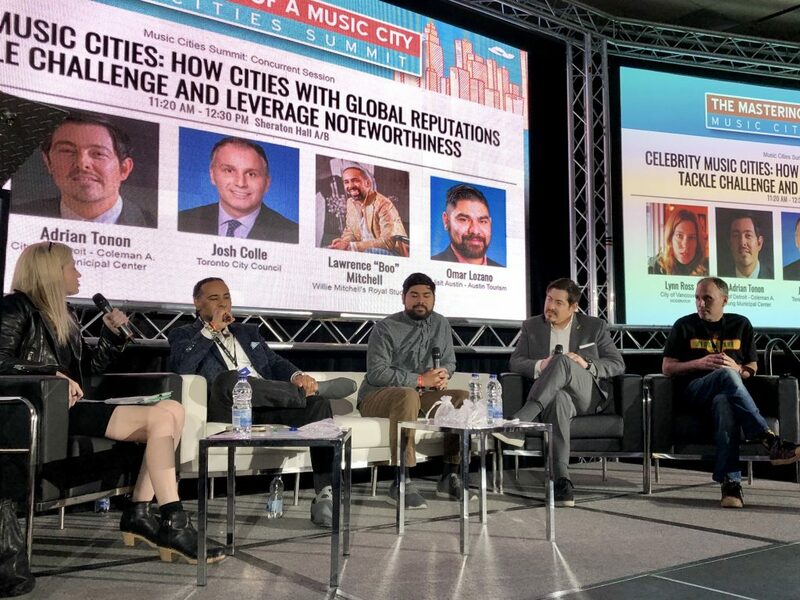 On Saturday, May 12th, Music Canada held its third annual international Music Cities summit The Mastering of a Music City during Canadian Music Week 2018. Conference delegates, policy-makers, urban planners, and music community members all gathered to discuss topics related to the value of music, its economic impact, and its relationship to innovative city planning and creative entrepreneurship. Click here to view more recaps of panels from the summit. The morning featured a panel entitled Celebrity Music Cities: How Cities With Global Reputations Tackle Challenge and Leverage Noteworthiness. The panel examined how cities with a rich musical history approach the current challenges facing their music ecosystems, and how that reputation can either be a benefit or a hindrance. The discussion was moderated by Lynn Ross, who works as a Cultural Planner at the City of Vancouver. Panelists included: Adrian Tonon, City of Detroit; Toronto City Councillor Josh Colle; Lawrence “Boo” Mitchell, Owner/Manager of a prominent record label in Memphis, Tennessee; Omar Lozano from Visit Austin, Austin Tourism. The conversation kicked off with a discussion of some of the major challenges facing each of the panelists’ cities. Councillor Josh Colle touched on the exciting growth of Toronto as a Music City, but highlighted how this rapid growth puts pressure on every aspect of the music industry – particularly for venue owners and artists who face barriers to affordability and livability. Adrian Tonon went on to discuss how the economic crisis that plagued the City of Detroit for the last several decades meant that music, film, and other cultural services were delegated to lesser priorities. But the city has been making recent steps towards a strong recovery, and Tonon described how his work leading the Mayor’s Film, Music and Night Time Economy initiatives have helped contribute to the development of the city’s thriving arts and culture scene. The panel also touched on the role celebrity artists can play in building up and promoting their city on a global stage. Lawrence “Boo” Mitchell highlighted the deep, rich musical history of Memphis that produced legendary icons like Elvis Presley and Johnny Cash. Mitchell discussed the importance of not just promoting the biggest names, but to instead use that as a foundation and work towards embracing some of the newer artists whose musical catalogue could also put Memphis on the map. Councillor Colle went on to reflect on the importance of artists like Drake and The Weeknd, who have become de-facto Toronto ambassadors, and whose success shined a light on youth hip hop scenes that were quietly thriving in cities across Canada. Another major topic of discussion was the important relationship between city government and music stakeholder groups in the journey to develop their Music City. Detroit’s Adrian Tonon highlighted how critical it was from the city side to ensure all the key players who had been previously working in silos were brought together to have a seat at the table, and in turn, collectively strive towards implementing the city’s strategic music priorities. Omar Lozano also touched on the uniquely important role that non-profits play in Austin. Organizations like Austin Music People and the Austin Music Venue Alliance have worked with the municipal government on various initiatives, and more broadly, are continuing to make important strides towards progressive change. Watch a video of the full discussion below, and stay tuned next week for a recap of another panel from the summit.